I think pearls are so refined around a woman’s neck. They scream class and Audrey Hepburn and Chanel. They can be worn to dinner, the movies, the theater and the grocery store. They go great with a little black dress or jeans and a tee shirt. They should be a staple in every woman’s wardrobe. But, should you go natural or should you go cultured with your pearls and what is the difference? Pearls naturally have come from nature and they are formed as the nacre builds up in layers around the silt that has gotten lodged in the mollusk. But, natural pearls are formed by chance. Pearls that are nurtured, or cultured, are human creations formed by inserting a tissue graft from a donor oyster, upon which a pearl sac forms, and then the inner side causes calcium carbonate in the form of the nacre. The process of culturing pearls revolutionized the pearl industry and meant that pearl farmers could control the cultivation of large numbers of consistently high quality pearls, which allows farmers to produce millions at a time. Cultured pearls are consistent when it comes to size, shape and color, but it’s extremely rare and difficult to find a string of natural pearls that are the exact same shape, color and size. How Does a Pearl Become Cultured? A pearl farmer introduces a shell bead into the oyster or mussel and the mollusk deposits layers of nacre around the bead. Freshwater cultured pearls come from freshwater mussels and are produced by Japan, China, and The United States. The pearl is formed by inserting a piece of mantle tissue into the soft tissue of the nucleus of the mollusk. The tones of the freshwater cultured pearls are dictated by the mother shell and vary from white to pink, but can be other colors as well. The most famous type of freshwater cultured pearl is the Biwa pearl, which used to come from mussels grown in Lake Biwa, Japan’s largest freshwater lake, but because of pollution, production has stopped. There are about 20 different species of mollusks that are commercially harvested for freshwater cultured pearls. For a saltwater pearl to be formed a mother-of-pearl nucleus is inserted into the soft tissue of the nucleus of the oyster. The artificially inserted nucleus, which is basically a round bead, is nearly as large as a natural pearl. 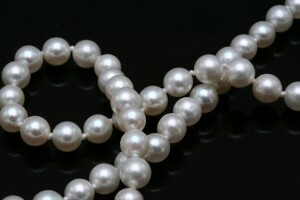 So, Can I Tell The Difference Between Natural and Cultured Pearls? Not unless you REALLY know your pearls, because the only way to make absolute certain whether a pearl is natural or not is to perform an x-ray of the pearl. A natural pearl may show growth lines where layers of nacre have been added by the oyster. Cultured pearls on the other hand will appear to have a perfectly rounded nucleus that’s surrounded by a halo of conchiolin and finally a thin outer layer. Here’s what you need to remember. A cultured pearl is cultured and can go to the opera, the theatre, the grocery store, dinner and the movies. It can be worn with a little black dress and jeans and a tee shirt. Audrey Hepburn looks fabulous in hers and they are just as real as natural pearls.